Another wonderful day packed with information and resources. I’ve spent some time tonight uploading a stack of links onto the resources page on my blog: click here (or click the link above). Take the time to check them out – there are some fantastic web resources and documents that you may not have known about before – some of them were certainly new to me. It’s quite late and I need to be up early for tomorrow’s plenaries, but I’d just like to include a few reflections from today’s learnings. One comment by American Psychologist David Jobes really stuck with me – he called on clinicians and all those working with people experiencing suicidal ideation, to really think about what service that person is getting. He reflected on how some people who showed up to Emergency Wards were told “not you again – I want to help a real patient”. What we must always keep at the forefront of our minds is the dignity of EACH person standing before us and the preciousness of their life. It made me think of the role of teachers in schools – it’s been said time and time again, but teachers may never know the impact they have on the students in their care – so we must, in every instance, maintain the dignity and integrity of our students by treating them with respect and listening to their story. This conference has been very much geared towards clinicians working with patients in the field of mental health – and that’s fair enough (and very important might I add). I’ve managed to navigate my way through the workshops of most relevance to teachers in NSW schools – a workshop on Gatekeeper training here, a study on adolescent social networking habits there, a speech on global youth suicide stats in between – so it has been most useful for my research… but I must say – I’ve been a little shocked at the fact that the role of teachers in the overall strategies of intervention seems to me a little overlooked. Teachers have been given little to no mention in regard to the important role they play in knowing their students and, quite often, being the first to pick up on signs of risk and concern – and then being the frist step in the intervention process by speaking with the student, engaging a welfare/pastoral care team member and/or calling parents and, in many cases, linking in with an external agency. There is still another full day of the conference tomorrow, so perhaps it might get mention. I’ve asked questions in a number of the session to try and bring this point forward and it has lead to a few great networking conversations between sessions – so not all is lost. Clinicians certainly play an indispensable role when it comes to looking after young people with mental health concerns – my argument, however, is that if we can equip teachers with more skills in EARLY intervention we could considerably ease the burden on our Mental Health services – many of which are drowning with extended waiting periods – or, as in the case in rural areas – where youth Mental Health Services do not exist at all. Among many other sessions today, I sat in on a workshop on suicidal helplines. 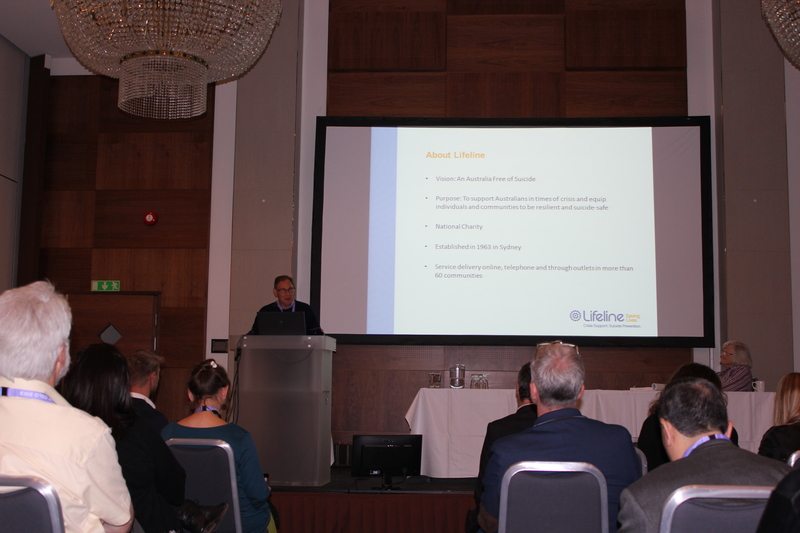 With the integration of the internet – many of the helplines from around the world have now included live online chat counselling as part of their methods in answering the ‘call’ of people in need (including our very own Lifeline Australia – the Director Alan Woodward presented at this session today. As an ex-Lifeline Macarthur telephone counsellor, I was very intrigued about the way it has evolved, particularly in the past 5 years). The statistics show that the number of youths (14 – 19) who are accessing helpline counselling services through online chat is climbing. Research is showing that young people find this method less confronting, more accessible and more anonymous. Something else for those of us who work in welfare/pastoral care to ponder. At another of the sessions, the workshop looked more generally about suicide in relation to the internet – what is out there, why people are accessing certain things, who is accessing various resources. The presenter looked at the pros and cons of the internet as both a source where help may be sought and also a source that can be exceptionally destructive with people using it to find other likeminded people, information about suicide (in fact, the most popular search term in Google, connected to the work suicide, is ‘methods’). Contagion is certainly an issue when it comes to the internet – particularly if a celebrity chooses to commit suicide, or if a particular new method is given air time through the media (one clear example of this comes from China where a well known actor chose to kill himself by a method of inhaling the fumes from burning charcoal – after this event there was a huge surge in numbers of young people who copied this method – this has lead now to changes in policy and reduction in the accessibility of charcoal in the country as a proactive preventative strategy). I know when I was researching for my novel, the ease at which destructive information regarding suicide is accessible is alarming to say the least. The other important thing the presenter mentioned was that there were many reported cases where people had reported their suicidal intentions via their social networking sites, like Facebook, but their online ‘friends’ had either ignored this or berated the person publicly through their account. It was reported that in one instance a woman in the UK had over 1000 friends, updated her status regarding her intention to kill herself – and received no response from anyone. She died that night. Situations like this really give me shivers. I think of the young people in our care and the virtual world of the internet that consumes so much of their existence. I’m not sure if I phrased the question badly, or if the presenter misunderstood what I was getting at, but unfortunately, the only response I got to the question was that search engines will only bring up the links which are most popular – not the ones that are most useful or most productive. End of response – this is a significant point and one worth reflecting upon, but I must say that I was disappointed that the presenter mentioned nothing about the role of teachers or how we educate young people to be better users of the internet. I guess we already know the answer to that anyway. – there are an estimated 10 – 20 million suicide attempts each year. I love the overarching vision of Lifeline Counselling Service: An Australia free of suicide. It is important to acknowledge that suicide is preventable – we can and must do better. Well, it’s after midnight here in chilly Norway – time to get some sleep otherwise I’m going to be struggling in the sessions tomorrow. Stay tuned – and don’t forget to check out the resources page. Is there a link to the online modules for teachers discussed in this post? The one from the Netherlands? It is definitely something I would like to follow up. I agree that more teachers/Coordinators need to build up their skills on how to recognise when one of their students need more support. Teachers are often the first people to notice when there is a change in a young person, I believe that every teacher is a teacher for wellbeing. Great to hear you got home safe. I don’t have a link to the modules on the page yet as they weren’t created in English. I do have the research paper, however, which may be a good start – it has all the results from the investigation with some great figures in the improvements to teacher confidence. I’ll pop this on the page tonight when I get to the next hotel. Teachers – the keepers of the keys?